Cathy Serafica Deleon, branch manager of the Los Alamitos-Rossmoor Library of the Orange County Public Libraries, had high praises about the event in the context of the library system. “It is exciting,” she said, “because we now have a place to bring kids to, this being the only Filipino American collection of its kind in Southern California.” She added that the situation today is a huge contrast of the days when she was growing up. Back then one could count the number of Filipino books around in one hand. Ms. Deleon and Mr. Villanueva were keynote speakers during the October 27 open house event. Villanueva is credited with coming up with the idea of establishing the Filipiniana prompted by memories of his kid days when, he said, he was virtually lost to his lonesome self and with no way of connecting to his roots and culture. No culture, no books, no dance, no music, he mused. Michelle Magalong of the MyHiFi group came up with a media presentation entitled a Filipino-American Historical Perspective. The proposed repository is reportedly anchored by a donation of about 100 books coming from Reme Grefalda’s personal collection. Grefalda, according to a website, is the founder of Our Own Voice and resident playwright of QBd Ink, a repertory company in Washington, D.C. And, of course, there’s Linda Nietes, owner of Philippine Expressions Bookshop, who also pledged a sizable donation of books by Filipino authors. The Philippine Heritage Collection will be the foundation of the literary, historical, and cultural documentation of FilAms and Philippine experience, it was said. Joselyn Geaga-Rosenthal, president of the Echo Park Library Community Group (EPLCoG), was quoted saying that the donated books will immediately go into general circulation. PnoyWatchDog revisited the library nearly two weeks after the event but could not locate the said collection. The lady tending the information desk said that the collection will be available shortly. Others on the EPLCoG board are Lisa Baca-Sigala, treasurer; Ms. Bonnivier, secretary; Dr. Marc Caratao, Cora Marte, Isa Meksin, Ramona Souza, Caroline Lorenzo and Jose Sigala. The latter two co-chaired the event. 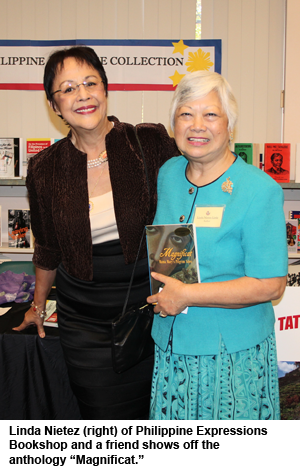 About 20 Filipino American authors were in attendance. According to Ms. Nietes, trailblazer in promoting Filipino books in U.S.A., among those invited to talk about or read from their works included Ruben Nepales, Noel Alumit, Giovanni Ortega, Lorna Dumapias, Sumi Sevilla Haru, Lorenzo Paran III, Leslie V. Ryan, Juanita Santos Nacu, Zosimo Quibilan, Percival Campoamor Cruz, Nenita Pambid Domingo, Marc Lawrence, Albert Mortiz, Frank Tinio Lopez, Carina Monica Montoya and Eliseo Art Silva. Ms. Nietes herself signed copies of the anthology, The Magnificat: Mama Mary’s Pilgrim Sites, edited by Cecilia Manguerra Brainard who was out of town. Nietes is one of over twenty contributors who have shared their personal experiences of healing of mind, body and spirit after their pilgrimages to sites all over the world dedicated to the Blessed Mother.